Have you ever faced a dangerous situation that ended up leading to greatness? Or semi-greatness? I usually write about the publishing world on Fridays but when I came across this symbol I was dumbfounded by its message and had to share it. If you go to last Friday’s post I did write about the decision to become an indie author if you’d like to read that one. Thanks so much for stopping by my blog today and following me! I came right over and am now following you also thru GFC. I love to read and if the book is good I can finish it in one day! I am thinking of contacting a few of my favorite authors to see if I can start reviewing books. Is it hard to get them to send you a book? Again, thanks for coming by and have a great weekend! It's great to be able to take a potential dangerous situation and change it into an opportunity. By the way those are two characters and not brush strokes. 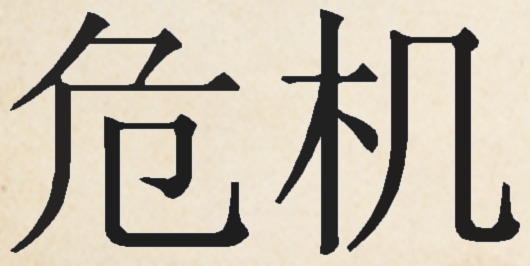 The 1st Chinese character itself is made up of six strokes while the other is made up of six brush strokes too. Brush strokes refers to the number of movements of the brush(pen) to create the character(word). Great advice. I've never thought about it that way, but it's very true! Thanks for hopping by! I'm returning the follow! That's really interesting. Thanks for sharing!! That's so interesting. And good advise. Following back from the Friday blog hop!